If you enjoy the digital version, consider the environment, and while visiting the member area, opt out of receiving the print version by selecting "My Profile," "Communication Preferences." Please send suggestions for continued improvement of the mobile version to lnovak@michbar.org. The Michigan Bar Journal accepts the following for publication: (1) general-interest articles, (2) theme issue articles, and (3) contributions to a column. The Michigan Bar Journal welcomes letters to the editor. Letters that appear in the Bar Journal do not necessarily reflect the official position of the State Bar of Michigan and their publication does not constitute an endorsement of views that may be expressed. Letters must not exceed 250 words. Preference may be given to letters responding to opinions, articles, or columns recently published in the Bar Journal. Unsigned letters, letters with profane or defamatory language, or letters promoting products, services, or political candidates will be rejected. Not more than three letters from any individual will be published in a given year. Publication is at the discretion of the editor and letters may be edited for grammar, style, or length. All letters become the property of the Bar Journal and may be republished in print or electronic form. Copies of complete issues of the Michigan Bar Journal from 1921 to the present are available in a searchable archive through HeinOnline. Log in to the member area and select “Bar Journal Search” from the list of options at right. 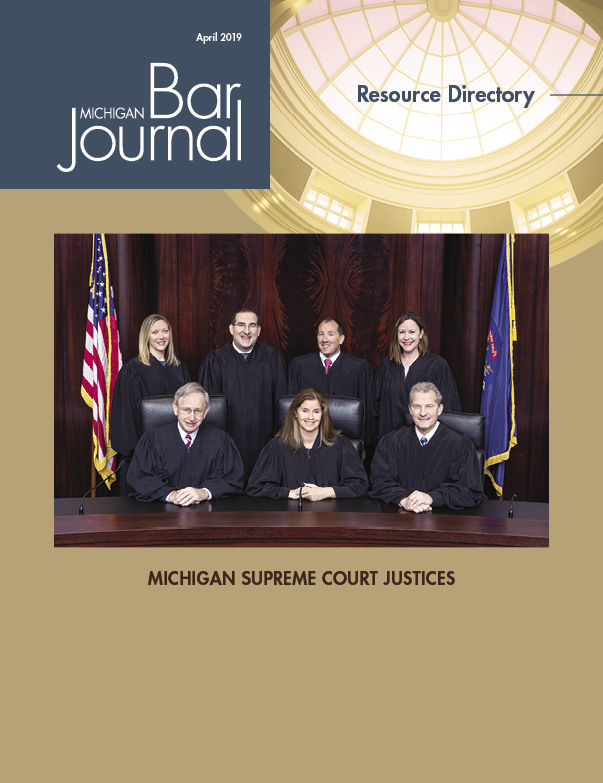 At the HeinOnline home page, select “Michigan Bar Journal” below Browse Collections by Name to display a list of all MBJ issues by volume number and year. For assistance, select “Help”from the HeinOnline menu at the top of the page. High-quality pdfs of feature and general articles, department columns, and of-interest pieces published in January 2001 to the present are available in the MBJ archive. Articles published in 2000 are available in the MBJ archive in html format. To request a copy of a specific article, print the article request form and mail or fax to SBM. To order 25 or more copies of an article, use our article reprint service form. Best Practices is a regular column edited by Gerard Mantese and Theresamarie Mantese designed to highlight best practices and ideals in all aspects of the law, including transactional work, law firm management, ethics and standard of care issues, and technology. To contribute an article, contact Mr. Mantese at gmantese@manteselaw.com. Citizen Lawyer is an occasional feature focusing on public service achievements by recognizing lawyers and judges who have made an exceptional voluntary contribution to community causes. To nominate a lawyer, send his or her name and the reasons for your nomination to Rebecca Schnelz at rschnelz@yahoo.com. Law Practice Solutions is a regular feature brought to you by the State Bar Practice Management Resource Center (PMRC), featuring articles on practice management for lawyers and their staff. Please direct column submissions or suggestions to JoAnn Hathaway, practice management advisor. For more resources offered by the PMRC, visit the Practice Management Resource Center. Libraries and Legal Research is authored by guest columnists who share their expertise regarding legal research strategies and sources. Plain Language is a regular feature edited by Joseph Kimble. To contribute an article, contact Prof. Kimble at WMU–Cooley Law School, 300 S. Capitol Ave., Lansing, MI 48933, or at kimblej@cooley.edu. For a list of previous articles, visit the Chronological Index of Columns. Practicing Wellness is a creative outreach effort of the State Bar of Michigan Lawyers and Judges Assistance Program (LJAP), presenting readers with a variety of articles on subjects pertaining to attorney wellness. Please direct column submissions or suggestions to Tish Vincent, LJAP program administrator. For information about advertising in the Michigan Bar Journal, an award-winning publication, please visit Advertising Opportunities on our website or contact Stacy Ozanich, sales representative, at (517) 346-6315 or e-mail sozanich@michbar.org. Read the Michigan Bar Journal readership survey results. Articles and letters that appear in the Michigan Bar Journal do not necessarily reflect the official position of the State Bar of Michigan and their publication does not constitute an endorsement of views which may be expressed. Readers are invited to address their own comments and opinions to lnovak@michbar.org or "Opinion & Dissent," Michigan Bar Journal, Michael Franck Building, 306 Townsend St., Lansing, MI 48933-2012. Publication and editing are at the discretion of the editor. Copyright 2013, State Bar of Michigan. The Michigan Bar Journal wishes to encourage republication and dissemination of articles it publishes. For information about securing permission to reprint Journal articles, please address inquiries to lnovak@michbar.org. The contents of advertisements that appear in the Michigan Bar Journal are solely the responsibility of the advertisers. Appearance of an advertisement in the Michigan Bar Journal does not constitute a recommendation or endorsement by the Bar Journal or the State Bar of Michigan of the goods or services offered, nor does it indicate approval by the State Bar Standing Committee on Professional Ethics or the Michigan Attorney Grievance Commission. Advertisers are solely responsible for compliance with any applicable Michigan Rule of Professional Conduct. Publication of an advertisement is at the discretion of the editor. The publisher shall not be liable for any costs or damages if for any reason it fails to publish an advertisement. The publisher's liability for any error will not exceed the cost of the space occupied by the error or the erroneous ad.